Opinion: 5 Ways The U.S. Retreated From The World Stage Under Trump This Year In 2018, the Trump administration made good on its promises to unwind long-standing U.S. commitments to guarantee global security and prosperity, writes Ted Piccone of the Brookings Institution. 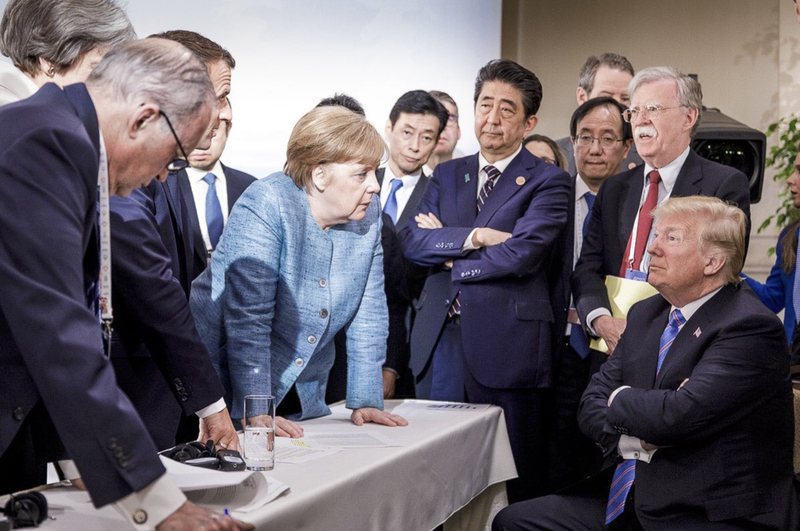 Germany's Chancellor Angela Merkel (center) speaks with President Trump during the Group of Seven summit in La Malbaie, Quebec, Canada, on June 9. The Trump administration has surprised and frustrated allies in areas including trade, security, human rights and the environment. Since taking office, President Trump consistently has argued for a brand of U.S. leadership in the world that seeks to maximize national sovereignty at the expense of international cooperation. Underscoring each country's unique history, Trump told the United Nations General Assembly in September that "the United States will not tell you how to live or work or worship. We only ask that you honor our sovereignty in return." His current top lieutenants — John Bolton as national security adviser and Mike Pompeo as secretary of state — have promulgated this worldview with gusto. As Bolton declared in denouncing the International Criminal Court, "no committee of foreign nations will tell us how to govern ourselves and defend our freedom." Two years into office, the Trump administration has followed through on these proclamations by abandoning international institutions and agreements it believes infringe on national sovereignty. From arms control to migration to postal services, this White House has chosen threats and unilateral withdrawal over principled engagement and negotiation. The effects, intended or otherwise, are coming into focus: growing disappointment and skepticism, even among our friends and allies, regarding U.S. leadership, and an opening for U.S. rivals like China and Russia to fill the vacuum. Here are five ways the United States retreated from the world stage in 2018. Trump was highly critical of President Barack Obama's successful efforts to control Iran's nuclear weapons capacity in exchange, upon verification, for some sanctions relief. Despite a powerful pro-deal coalition that included China, Russia and the European Union, the Trump administration moved the goal posts by demanding additional commitments to contain Iran's hostile actions against its neighbors. After a tepid effort to set new terms, the White House decided to break away from the agreement and reimposed sanctions on Iran starting this past summer. In response, Iran has held steady in fulfilling the terms of the nuclear accord while Europe tries to work around the U.S. sanctions. The world's top body for addressing human rights violations in every country is, in the words of Secretary Pompeo, "an exercise in shameless hypocrisy." While the United States is right to criticize its bias against Israel and its authoritarian members, the council continues to shine a bright light on severe abuses from Myanmar to North Korea. But when the council turned its attention to U.S. failures to uphold universal human rights norms on issues such as treatment of migrants and poverty, Washington cried foul and walked away. In response, a core group led by countries such as Egypt, Cuba and Saudi Arabia has redoubled efforts to weaken the body's agenda to scrutinize countries' human rights records and protect civil society. China, in particular, has begun going on offense to assert its own brand of state-led capitalism as the better path to human rights and development. After 70 years of bipartisan support to Palestinian refugees displaced by conflict with Israel, the Trump administration decided in August to stop funding the U.N. Relief and Works Agency for Palestinian Refugees. It also cut overall aid to the Palestinian Authority and ordered it to close its Washington office. Claiming to carry a disproportionate share of the burden of caring for an expanding number of Palestinian families, Trump's real intent was to pressure the Palestinians to reach an agreement on peace with Israel. "The United States was paying them tremendous amounts of money. And I say, 'You'll get money, but we're not paying until you make a deal,'" Trump told a group of American Jewish leaders. Efforts to close the gap are falling short: The World Food Programme says it will have to cut food aid next year to nearly 200,000 Palestinians in Gaza and the occupied West Bank due to U.S. budget cuts. Trump further isolated the United States when he went ahead with moving the U.S. Embassy to Jerusalem in May, after all other members of the U.N. Security Council voted to reject the action. As part of an overall rollback of Obama-era provisions aimed at reducing U.S. carbon emissions, President Trump in 2018 made good on his previous announcement to withdraw from the Paris climate agreement, claiming climate change was a hoax promoted by China to hurt our economy. While the actual withdrawal does not take effect until just after the 2020 presidential elections, U.S. officials are quickly rewriting domestic rules to promote fossil fuels in contravention of international commitments. At the recent global session to negotiate a "rulebook" for implementing national commitments, a top U.S. delegate drew protests as he made pronouncements favoring "clean coal" and shale gas. Meanwhile, at the Group of 20 summit in Argentina in November, Trump was the only leader who did not reiterate a commitment to climate action, despite new reports by leading scientists that catastrophic warming will begin to hit in 12 years unless carbon emissions are dramatically cut. U.S. soldiers gather for a briefing during a combined joint patrol rehearsal in Manbij, Syria. 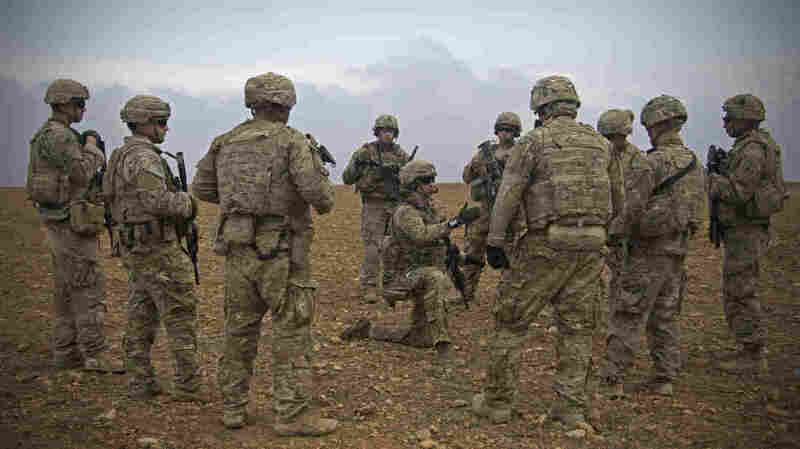 Last week, President Trump said the Islamic State was defeated and that U.S. troops would withdraw, prompting criticism from allies who said the extremist group remains a threat and pulling out now would lead to its resurgence. The latest demonstration of President Trump's strong instincts to unload the burden of collective security on others (friends and foes) came on Dec. 19, when he declared victory over ISIS terrorists and ordered approximately 2,000 U.S. troops to cease action in Syria immediately and return home. The hasty decision directly contradicted public pronouncements by his most senior advisers that U.S. troops would stay and left close allies like the United Kingdom and France, which also have troops deployed in theater, dismayed and vulnerable. The result was, by most accounts, a win for U.S. rivals Russia and Iran, which now have a stronger hand in the region, as well as for Syria, ISIS and Turkey, and a loss for U.S. allies Israel and Saudi Arabia. The decision has wider negative repercussions for U.S. reliability with its long-standing partners, prompting Secretary of Defense Jim Mattis to resign. The Trump bluster to shake up the international order in the name of extracting better deals for the United States may yield some new agreements that further narrow national interests. But the costs to U.S. influence are already proving very high. U.S. friends are confused and frustrated with Trump's disrespect and unpredictability, and rivals are eagerly exploiting the opening to their advantage. The continued rise of Trump transactionalism in the name of "America First" means we may be entering an inexorable slide into geopolitical competition the likes of which we have never seen before.